Heald (Kimball) Hauler Caliper Brake Assembly Service Kit 205-019 for Carl Heald Hauler Hydraulic Brake Assembly (Pad Replacement Set w/ Rivets). VERY LOW STOCK. CALL NOW FOR AVAILABILITY, PLEASE! Pressure Plate (205-025) now sold separately as Item 205-016 without pad. Genuine Kimball-Power Tec part made in USA! 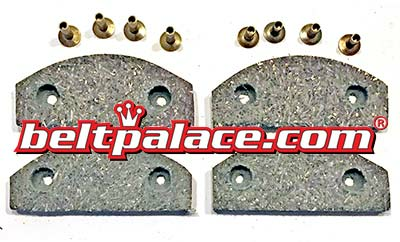 Pressure Plate 205-016 for Heald Hauler HH1211, HH1216 caliper brake systems. 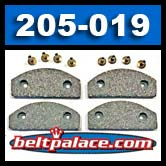 Single Pack, Brake Shoes sold separately. PowerTec Hydraulic Brake Line. Sold as Single hose and ends assembly. Original PowerTec part purchased prior to their closing.